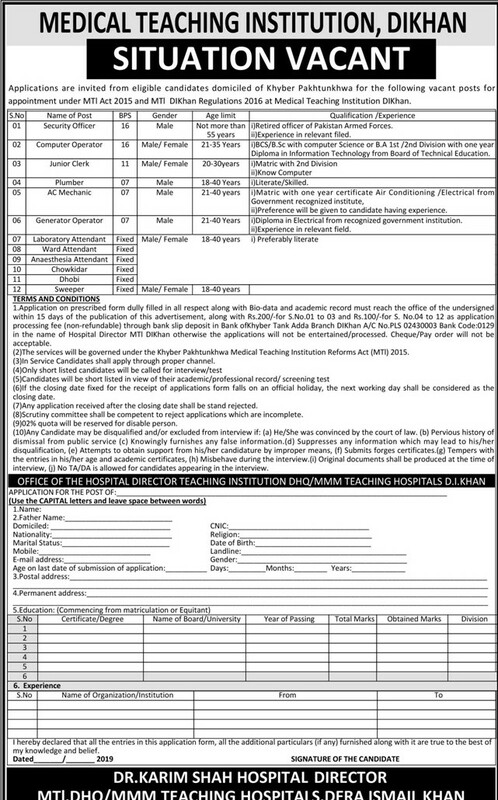 Applications are invited from eligible candidates having domicile of Khyber Pakhtunkhwa (Kpk) for the following posts for appointment under MTI Act 2015 D.I Khan Regulations 2016 at Medical Teaching Institution D.I Khan. Qualification: Retired officer of Pakistan Armed Forces. Qualification: Matric with a certificate in the Air Conditioning/Electrical. Application on prescribed form duly filled in all respect along with bio-data and an academic record must reach the office of undersigned within fifteen days of the advertisement, along with Rs. 200/- fee (not refundable) through bank slip deposit in Bank of Khyber Tank Adda DI Khan. The services will be governed under the Khyber Pakhtunkhwa Medical Teaching Institutions reforms 2015. In service, candidates shall apply through proper channel. Candidates will be short-listed on the basis of their academic record and test. If the last date happens on the holiday, the next working day will be considered as the last date/closing date. Applications after the due date will not be considered. 02% quota shall be reserved for disables.